The stationary bike, long gone are those rickety metal monstrosities that used to gather dust all alone in the back of the gym. 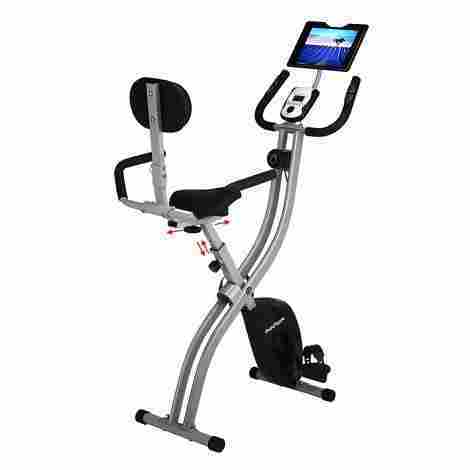 Today’s stationary bikes are now technologically complex, with easy to use adjusters, high-quality LCD displays, and all kinds of cool extras that allow all your spinners, or riders long distance riders to stay at the top of your riding game no matter the weather. We agree that riding a bicycle is an excellent form of exercise that primarily works the lower body and cardiovascular system. Many people enjoy this form of exercise since it’s easy on your legs and will give you a good workout. However, it’s not always possible to take a bike ride outside for a number of reasons that include things such as the weather, traffic, and time. For this reason, many people ride stationary bikes, which are also known as exercise bikes and indoor bikes. This allows you to go for a ride without ever have to move. Many people enjoy this since they can exercise comfortably in the indoors and do things such as watch a movie or tv show or listen to music while they exercise. We've added three new products onto this list include a new editor's choice and a new best value choice. And there isn't much better when it comes to low impact exercise than a good bike, even if it's not moving. So as winter sets in and you're determined to stay in shape one of these babies might just be what you need. You can purchase these bikes at just about any different price point so they are affordable for many people. There are also a number of different designs that you can pick between so that you can get the one that is best suited to your needs. 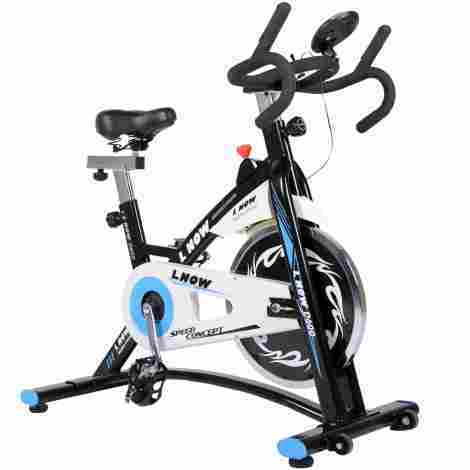 You will notice that most of these indoor bikes have features such as calorie monitors and heart rate monitors so that you can measure your workout as well so they are a great option. This one makes the top of our list because it’s sturdy, it’s cool looking and while the price tag is a bit high this is really a professional quality bike that is perfect for amateur bikers who really, really love to bike or even professionals who have to take a day training indoor. This really has got everything, including multi-grip handlebars and an LCD display that’s got all the bells and whistles. Unlike the bike you ride back and forth to work or for fun on the weekends a lot of stationary bikes are belt driven. That means a tough, sometimes Kevlar belt replaces the chain on your bike. This can make for a smoother ride, but it is also more likely to slip. But for stationary bikes belt driven bikes tend to be a bit more practical and a bit quieter. This is one of the things we like most about this bike. It monitors not only your speed, and time and Distance. But it also tracks calories and your pulse. That’s a nice little plus that puts this stationary over the top. Plus it’s high up off the handlebars to it’s easy to see and easier to manipulate. Okay you get what you pay for and you’re going to put a bit more money down on this bike than you are for a few others on our list. That being said this is a really, quality piece of equipment and we think that it’s worth every penny. But if you want to pay less, stay tuned. This AirBike allows you to get a full body workout. It has been well designed so that you have a smooth experience while you are using it. This will reduce the amount of impact that your body will feel as you peddle the bike. You will love how you look and feel after you have used this cross fit workout machine for a while. You can use the computer to track your workout progress and give you information such as calories, watts, and heart rate. It also has motivational programs that you can use. You can set different goals such as calories burned or a distance target. The AirBike will notify you when you have reached your goal so that you don't have to keep checking on your own. You should plan on spending an amount that is higher than the average price for the AirBike. This is a premium unit that is well made and has high-end features. There are ball bearings in the frame that makes for a smooth feel. The resistance comes from the fan in the front of the bike. It will give you a total body workout rather than strictly a lower body one. You can adjust the seat up and down as well as forward and backward. The computer controls let you set goals such as calorie goals. Users have had issues with the chain falling off. Some reviewers have reported that the gears strip after a while. Clearly the best deal, in a lot of ways. And yes we understand that this may not technically qualify as a Stationary bike, but it’s one of those little tools that you might just get addicted to. Slip it under your desk at work and happily pedal away while filling out those TPS reports. We don’t judge. Honestly though this is the little pedaler that could and while you won’t be doing any centuries on it, it could help you stay in shape when your desk bound. It folds to fit into a tiny space. Though we’re not sure it needs to as it’s only 9 inches tall at its full extension. Once settled it also has nonstick footpads to keep it from sliding across the floor where its placed. And it also has adjustable toe loops just to help keep you in place. You might not expect this in an under the desk stationary bike but it’s a nice addition to this little pedaler. It allows you to get the most out of your seated pedaling, though we do hope you don’t tend to over sweat, though that is a sigh of good health so truly we’re torn on the issue. Maybe we should just hope for tolerant colleagues. Well this clearly makes our best value pick. It’s cheap and simple and really is a one trick pony in that it’s not going to do much more than help you stay toned when you can’t get a real workout in, or just keeps your energy in check when you’re stuck behind a desk. This is a great option for indoor cycling. 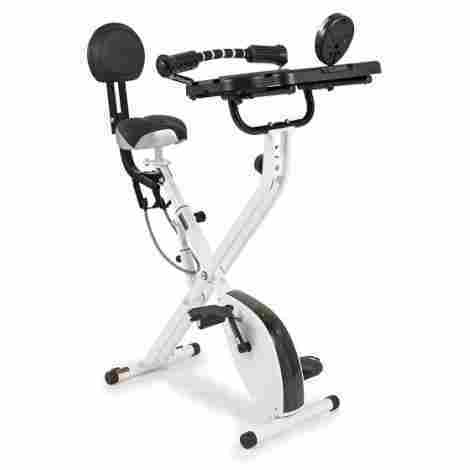 It has all of the features that you would expect which include different tension settings, adjustable seat, and wheels so that you can move it. This is a great way to maintain your figure or get in shape without having to leave the comfort of your home. You will love the smooth ride that you get. It has a flywheel that weighs forty pounds. 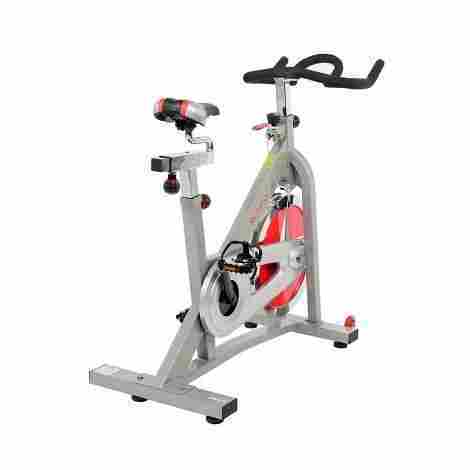 The flywheel provides you with plenty of momentum and will create a smooth feel as you use the bike which is easy on your joints. You can adjust the seat and the handlebars on this bike. This allows you to find a position that is the most comfortable for your workout needs. This item is sold at an average price so it's an excellent option for home users. You can get a bike that is well made and durable without having to pay a premium. There is a flywheel that weighs forty pounds so that you get resistance. You can adjust the amount of tension in the pedals. The seat and the handlebars can be adjusted as needed. There are wheels that you can use to move it. The seat is covered with leather and is fully padded. There is a belt on the pedals that is known to squeak. The resistance setting is not consistent and is hard to use. 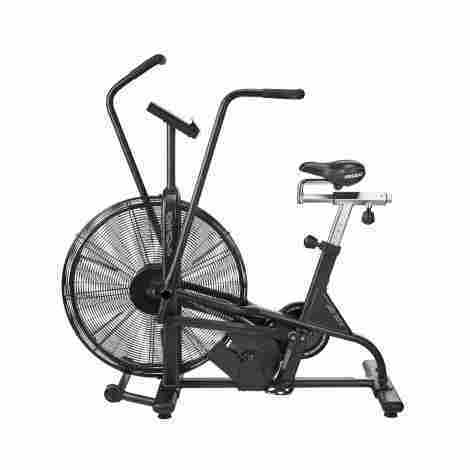 The Schwinn 270 recumbent puts some of the best of exercise technology in your home. 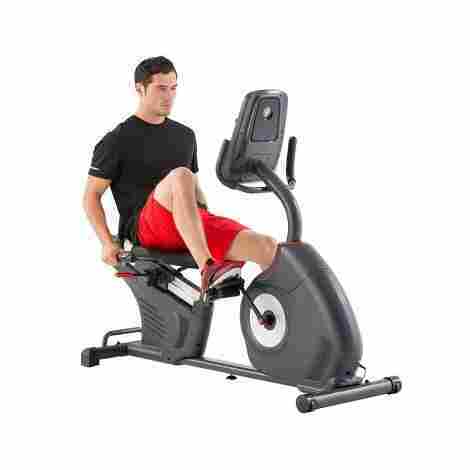 You will love the smooth feel that you will get from this recumbent so that you can work out without having to worry about an excessive amount of impact on your joints. You can also ride socially with other users online so that you can get great motivation. You can connect to this recumbent using its Bluetooth interface. This allows you to use it with the Schwinn Trainer smartphone application that will help you track your fitness. You won't have any trouble finding a workout program. This recumbent has 29 different programs. This includes programs that track your heart rate, quick start, and there are even fitness test programs. The Schwinn 270 is sold at a price that is higher than the average price. The higher price is due to it being loaded with many premium features that make it fun to use. It has a Bluetooth interface that you can use with a smartphone application. You can ride socially using the RideSocial application on your phone. There are 29 different programs that are installed on this machine. It has USB charging for your smartphone while you work out. You can track your progress by using the DualTrack LCD. Some users have reported that the seat is not comfortable. Other users have had issues with the smartphone application. As recumbent bikes go this is a nice one. It has most everything out top picks have including 8 levels of resistance, and an easy to use tension rod. The LCD display is sharp and also has an odometer and a calorie counter as well as the usual time speed and distance displays. The final thing we like are the weighted pedals that give the bike some great heft. We don’t really have to go into how important a good seat can be. It can turn a good ride into a great ride or a good ride into a painful, “I’m standing up on this last part” kind of ride. But in this case this seat is covered in high-density foam. These pedals have some heft which gives you more stability during your workout. 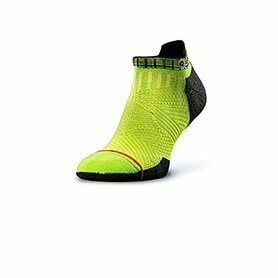 The adjustable foot straps also keep you safe and settled as you do your biking thing. Surprisingly cheap as high quality stationary bikes go. But we really like this one at the midrange because it does everything some of the more expensive models without the cost. The LCD display is top notch, the counterbalanced pedals help provide weight and heft to the bike, and it’s built of high quality steel tubing. It can be hard to stay in shape while you work at a desk. That's why the FitDesk has combined an exercise bike and office desk into a single unit so that you can stay active while you are getting your work done. It has a full computer desk where you can set your laptop on it securely without having to worry about dropping it. The desk has been built into the machine. It has a gripping surface that will keep your laptop from falling off of it while you are working. You can also use the tablet holder as well. The seat and the back are adjustable and you can even adjust them into a semi-recumbent position so that you can work and exercise in a comfortable position as you use it. One of the best parts of the fit desk is that you can purchase it for an average price. This allows you to get a great bike and workstation without having to spend a premium on it. It has a gearbox that is durable and long-lasting. There is a laptop desk built into the bike for work. It has a tablet holder so for a tablet device. You can adjust the seat and the back for comfort. Reviewers have had issues with the pedal straps breaking on it. The desk isn't large enough for some laptops or a keyboard. This is the perfect thing to own if you work from home. It's small design lets you put it underneath a computer desk so that you can exercise while you are working. You can also put it in front of your favorite couch so that you can use it while you are watching TV. Finally, you can put it on a table and exercise your arms. The Vive has an LCD screen that you can use so that you can track your progress. This lets you see important information such as calories that are burned or distance. Due to its small design, you can put the Vive on a table and then use it to exercise your arms and your upper body. The pedals have finger grips on them. The Vive is sold at a price that is lower than the average price. The lower price turns it into an excellent value since you don't have to pay a premium for it. You can use it to exercise your legs and your arms. There is a knob that you can use to set the resistance. It's small enough to put under a desk or on a table. There is an LCD screen that you use to track your progress. It has rubber feet that won't mark or scratch your floor. The motion in the pedal can feel rough rather than smooth. Other users have had issues with it wobbling while using it. Do you like to read or stream a movie while you exercise? 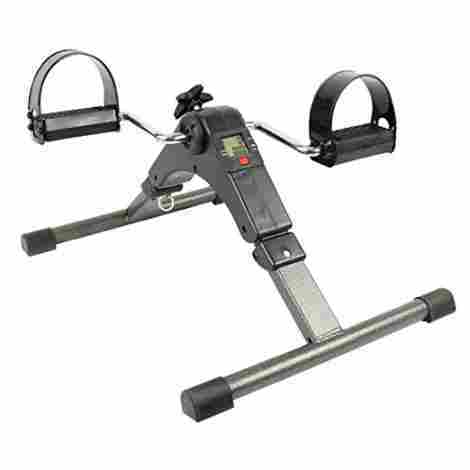 If so, then the XBBR450 is the perfect exercise machine for you. It has a tablet holder that is built into it so that you can use your iPad or another tablet with it. The machine folds up as well so that you can easily store it in a closet. It has an extra large seat that also includes a backrest. You can adjust the seat up and down as well as forward and backward so that you can reach the pedals. 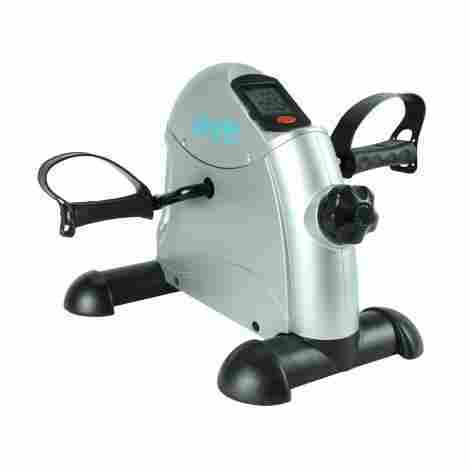 It has two flywheels that give you a smooth motion while you are pedaling. They have magnetic resistance so that you can adjust it to the level that you need. You can purchase this item at a price that is lower than the average price. The low price turns it into an excellent item for home use since you don't have to spend much on it. It has a tablet holder that can hold all of the major tablet brands. There is magnetic resistance that is adjustable to get the right resistance. It has a heart rate monitor so that you can check your heart rate. You can fold it up when you are not using it. It has a large seat with a back that is adjustable. Some users have reported that the monitor doesn't work properly. The adjustment knobs for the seat do not stay tight. 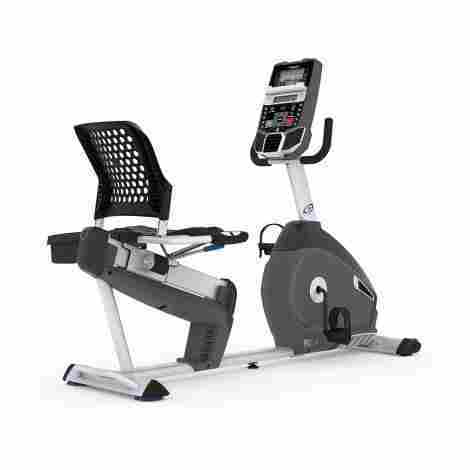 This is a great recumbent for your home and it is perfect for when you need to get into shape or stay in shape. You can even listen to your favorite music while you are working out with it since it has an awesome pair of speakers. There are other premium features on this recumbent that you will come to love. The Nautilus has a USB port that you can use to charge your phone or mobile device. The port can also be used to export work out data to the USB device. It comes with twenty-two programs installed. You can use these programs to add variety to your workout which will help you train and tone better as you use the recumbent. This is a higher end recumbent so you are going to need to plan on spending a little extra on it. It's packed with plenty of premium features that justify the higher price. There are two LCD monitors that you can use to track your progress. You can charge your phone or export data using the USB port. It comes with a heart rate monitor that tracks your heart rate. You will love how music sounds coming from the speakers. It has 20 different resistance options that you can pick from. Users have reported that the bike loses its resistance in less than a year. Reviewers have reported that it is hard to assemble the bike. Riding a bike is a great way to get plenty of low impact exercise. It’s easy on your legs, knees, ankles, and your feet which is why so many people prefer this kind of exercise. It’s also easy to get your heart rate up while you are riding a bike which makes it possible to lose weight, tone, or train. Many people enjoy riding for pleasure as well as exercise so there are lots of reasons to ride a bike. However, if you want to ride a bike indoors, then you are going to need a stationary bike. A stationary bike brings all of the benefits and pleasure of outdoor bike riding into your home. This makes it possible for you to get a great workout without having to expose yourself to the weather. For people that live in excessively hot or cold climates, a stationary bike makes it possible to ride year round. Many people like to entertain themselves or work while they exercise and you can use these bikes to watch TV, read a book, or work on your laptop computer without having to worry about a lack of exercise. This makes owning an exercise bike a great addition to your home. When you are shopping for an exercise bike, you are going to be presented with four different kinds. All of them accomplish the same goal and there isn’t one design that is necessarily better than another kind. However, the kind of bike that you pick out is going to affect your comfort while you are using it. Some riding positions can be more comfortable for some people than other ones so you may want to try the different styles in a showroom or a gym prior to purchasing. The upright type is the one that looks like a regular bicycle. It has a vertical seat that you can stand or sit on and the pedals are beneath you while the handlebars are in front of you. 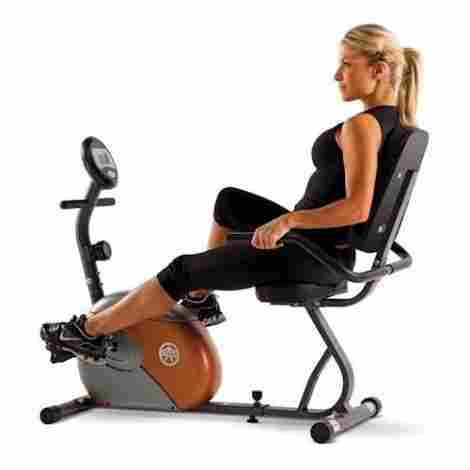 If you want to sit back or recline while you are exercising, then you are going to want to get a recumbent bike. This kind has the pedals in front of you and you lean back into the seat. The handlebars are position below the seat. If you like to watch a movie or read while you use the bike, then you may want to consider this style. Spin bikes have a high seat with the pedals positioned below you and the handlebars in front. They have more of a “V” shape than an upright bike so it’s difficult to stand up. Finally, you have the under the desk bikes. These are bikes that only have the pedal part and you have to use your own chair. They are best suited for home offices or when you are sitting on the couch and watching TV or a movie. No matter what style of bicycle you pick, you are going to need to make sure that the seat is comfortable. Nobody is going to want to use a bike that has a seat that isn’t padded or is too small or large for them. Some people may want to have a seat that has a backrest while other people might prefer one that doesn’t have a backrest. When you are looking at bicycles, you have to make sure that the seat is comfortable. Otherwise, you are not going to be satisfied with the bicycle. There are a few things that you will want to look for when you are picking out a seat. One of the first things that you will want to look at is if the seat can be replaced with different seats. This isn’t always possible, but it’s a nice feature to have because it will let you swap out the seat if you find that you don’t like it or need to replace it. The seat will also need to be adjustable both in the up and down positions as well as the back and forth so that you can reach the pedals properly. Next, you should make sure that the seat has enough padding and cushioning so that you feel comfortable while you are sitting on it. The final thing to check is if the seat has a backrest. Some people don’t always want a backrest while other people find it to be more comfortable. If the bicycle seat has a backrest, you should also make sure that it can be adjusted. This way you can be comfortable as you are using the bike. When you have used your bike for a while, you are going to build muscle. As you build muscle, you are not going to have to work as hard to pedal the bike which means that you are no longer going to continue to burn fat or tone your body. For this reason, you are going to need to be able to increase the resistance. Resistance refers to how difficult it is to pedal the bike. The higher the resistance setting is, the harder you are going to need to work in order to pedal the bike. Increasing the resistance is the way that you continue to gain while you work out. Whenever you feel that it isn’t challenging to use the bike, you are going to need to up the resistance in order to keep your workout challenging. Some bikes have a knob that you turn in order to set the resistance to the proper level. You may also see ones that control the resistance through electronic means. This is more common on bicycles that have programmable workout routines. There are also bikes that have no resistance control at all such as fan bicycles or bicycles that have heavy flywheels. These bikes use physics to control the amount of resistance for the user. Normally, you are going to want to get a bicycle that allows you to control the amount of resistance. Having the ability to set the resistance allows the bike to continue to offer you a challenging workout. It also makes it possible for other members of your household to use the bike since everyone has a different body and is at different levels. It’s recommended that you get a bicycle that has a heart rate monitor of some sort. This is because when you are exercising, you should keep a close eye on your heart in order to make sure that you are exercising at an optimal heart rate. This will help you strengthen your heart in the event that you are training for a competition or lose fat if you are trying to burn fat. Not all bikes have a heart rate monitor so you will want to find out if the bike has one or not. Bikes that cost less do not typically have a heart rate monitor. If this is the case, there are plenty of external monitors that are available for you to use for a low cost. However, for not a lot of extra money, you can get a bike that has a built-in heart rate monitor. These are usually integrated into the handlebars and the heart rate will appear on the display. Premium bikes allow you to use a chest strap to monitor your heart rate. A chest strap tends to give you the most accurate reading and will help you measure your heart rate better. You may also see exercise bicycles that have programs that keep you at your target heart rate. They work by changing the resistance in order to keep your heart rate steady. This is a premium feature but it’s very helpful to have for when you are trying to lose weight or are training. Such programs normally work by letting you use the handlebar heart rate monitor or the ones found in chest straps that work wirelessly. As the old saying goes, you can’t manage what you can’t measure. This saying is certainly applicable to health and fitness because you’ll need to track your progress in order to make sure that you are hitting your fitness goals. Your exercise equipment can help with this so you should be on the lookout for an exercise bicycle that will track important metrics so that you can reach your goals. Some of the most important metrics are revolutions per minutes (RPM), time, calories, and distance. All of these metrics will help you to make sure that you get the maximum amount out of each workout. However, it isn’t going to be enough to simply track these metrics. You are going to need a way to read them which is why the display matters. When you are looking for a bike, you should make sure that it has a clear display that makes it easy for you to read the required information. The display should be backlit as well so that you can read it when there isn’t a lot of light. Finally, the presented information should be clear and you should have no trouble understanding what you are seeing. Another thing that’s important for the display is to make sure that it has good controls. The controls should be easy to use while you are pedaling the bike and it should be easy to understand what the controls are doing. If you are having trouble figuring out what the buttons are doing, then it’s going to be really hard to use the bike while you are working out. The better the display is designed, the happier you are going to be on the bike. Q: What are fold-up bikes? A: Fold up bikes are great for people who do not have a dedicated fitness area in their homes. As the name suggests, this sort of bike can be folded up when you are not using so that you can store it out of the way or in a closet. If you are getting such a bike, then you need to make sure that it’s easy to put away and set up when you are using it. Q: Can I cross train on a bike? A: If you need a full body workout, there are certain bikes that have moving handlebars. You use such handlebars by pushing them back and forth while you are pedaling the bike. This will create a full body motion and allow you to cross train. It’s not a common feature but there are bikes that have this sort of configuration and you should look for them if you are interested in getting a full body workout. Q: How do I keep my bike from marking up my floor? A: The first thing that you will want to check is if the bike has rubber pads on the bottom. This will go a long way in protecting your floor. If you find that this isn’t sufficient you can get an area rug to put underneath your bike or purchase the puzzle mats that are commonly found in fitness clubs. This will help to protect your floors from getting marked up when you are using the bike. Q: Which bike is best for weight loss? A: When it comes to weight loss, there really isn’t one kind of bike that is better than the other. Weight loss is about creating a calorie deficit by reducing what you eat and increase when you burn off. When it comes to burning off calories, all kinds of bikes are suitable so you should pick one that feels the most comfortable to you so that you use the bike on a regular basis which will give you the best results. Q: Should I purchase the extended warranty? A: Rather than paying extra for an extended warranty, you should instead consider getting a bike that has at least a one year warranty on labor and a two to a three-year warranty for major parts. Most bikes are going to fail within this time period if they fail at all so it’s usually not a good value to get an extended warranty. If you are concerned about failure, then you are better off getting a higher end bike.